Located in Creston California, Rocky Top Kennels is an AKC recognized California Mini Australian Shepherd Breeder, providing generations of show quality Toy & Miniature Australian Shepherds throughout California and the western United States. At Rocky Top Kennels our priority is health for the pups. We don’t take shortcuts here, and work hard to ensure the litters are strong and healthy. We understand bringing a dog into your life is no causal undertaking. It is a life long commitment. 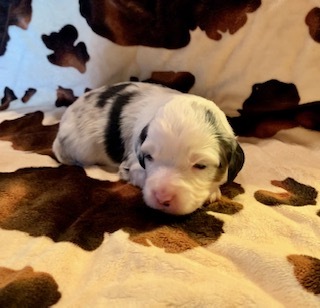 If you are looking for Miniature American Shepherd, Miniature Australian Shepherd, Toy Australian Shepherd puppy for sale please stop by and get to know our new litter, to see if one is a fit for you and/or your family. American Kennel Club working dog trials and ASCA trials. intelligence of an Australian Shepherd. by the National Stock Dog Registry. by the AKC or American Kennel Club. Cerf and OFA of good or better. For decades the breed status of the Miniature Australian Shepherd has been a highly debated topic. The very first mini Aussie shepherd was registered with the National Stock Dog Registry (NSDR). Since then other registries have formed and dictated the classification of the toy Australian shepherd. The American Kennel Club (AKC), United States Australian Shepherd Association (USASA) and the North American Miniature Shepherd Club of the USA (NAMASCUSA) have agreed to split the Australian Shepherd into two separate breeds. Under the AKC the smaller version of an Australian Shepherd is now classified as the Miniature American Shepherd. As of June 27th 2012 the AKC approved this breed for entry into the miscellaneous class. Entry into the miscellaneous group allows the Miniature American Shepherd to compete in AKC conformation events. My Dogs are the Best Little Wiggle Butts in Town! Call me at (805) 674-5579 for more information about our Mini Australian Shepherd puppies in California!